This past Saturday, I participated in the Evergreen Foundation‘s Green City Race. Along the lines of the Amazing Race and City Chase type of activities, we had a bunch of clues that we needed to follow to find different community landmarks, ranging from East Van to Cambie and False Creek to Gastown. It was a really cool opportunity to run around town and visit some pretty cool “green” places in the city. This utility in False Creek uses “waste heat recovery from untreated urban waste water.” I had no idea this was nestled under the Cambie Street bridge, providing renewable energy for the area. I love Bandidas. Not only do they serve awesome vegetarian food, but they have a sustainability credo that I love – they bike their produce around, and use sustainably sourced ingredients. Cool little community garden just off Commercial Drive, with a shed made out of cob. Random strangers cheering us on. Friendly people submitting to our requests for photographs of their reusable mugs and shopping bags. Planting an apple tree in Evergreen’s Urban Orchard. 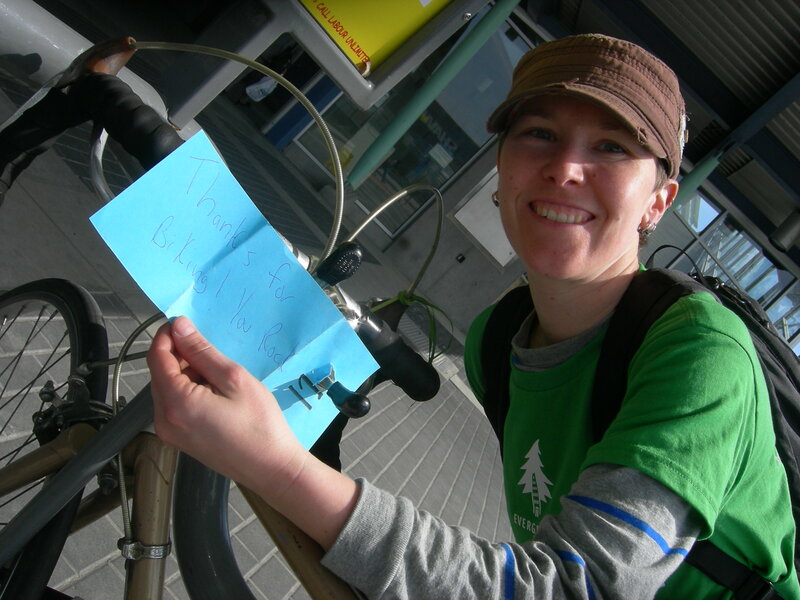 Leaving a thank you note for a cyclist on their bike. 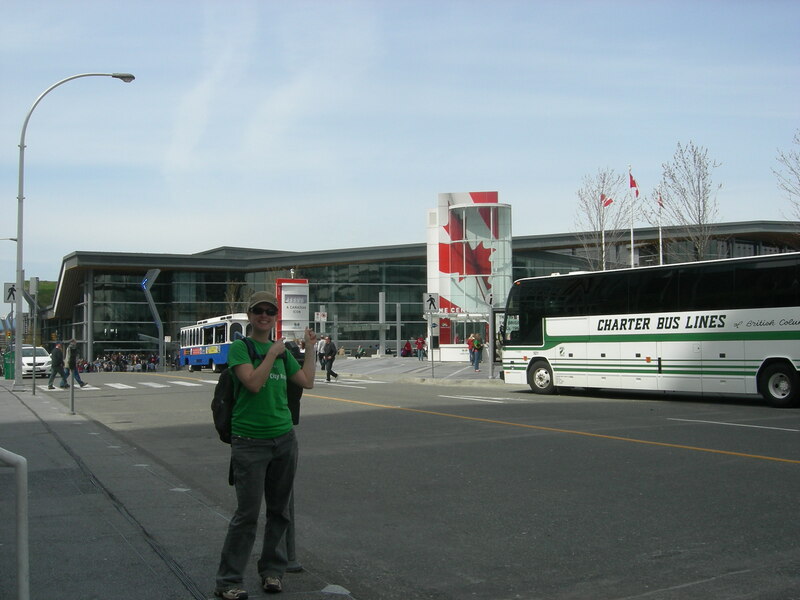 Proving to myself that I have a pretty good knowledge of the Vancouver transit system. Running around in the beautiful sunshine. Even without a smart phone (thanks to some helpers at home on computers), we were able to navigate the clues around the city. 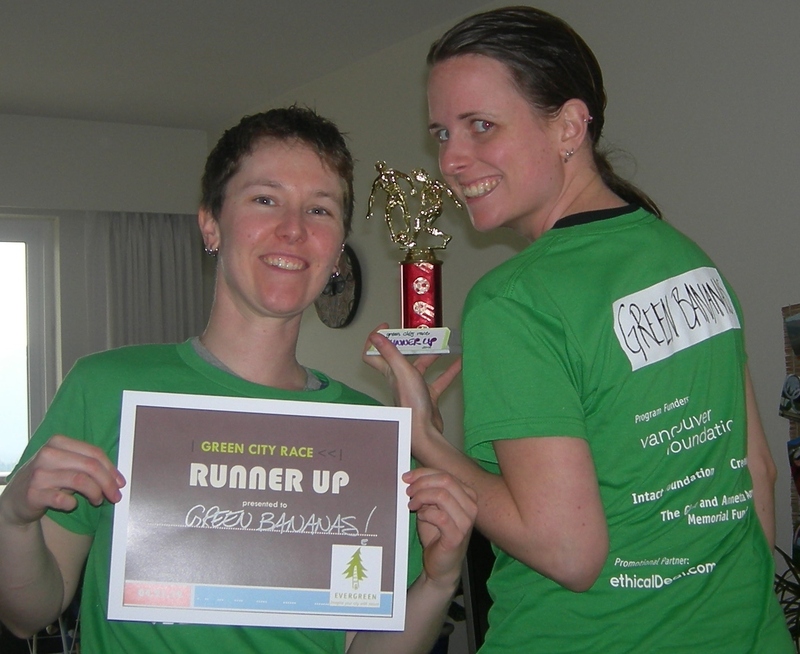 If you’re interested in green places in the city, having fun, and getting a little competitive, try this race out next year.We’re aiming for first next time!